A prelude to another Lola disaster… Or to come even closer to the truth: a stillborn disaster sandwich! 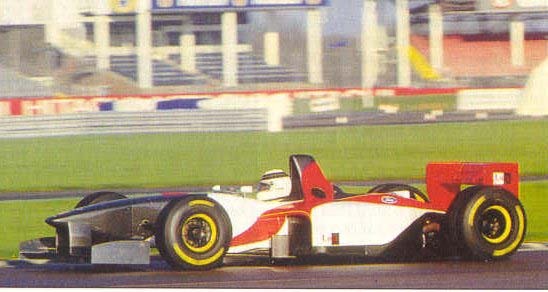 In 1995 DAMS Lola star Allan McNish was called in to test Lola's latest F1 design, the T95/30. At the time the Huntingdon factory did not have a customer for the car, as its previous machine, the Ferrari-engined T93/30, had been an absolute dog that effectively killed off all F1 aspirations that Lola's new customer BMS Scuderia Italia might have had at the start of the 1993 season. The memories were too fresh, and when McNish couldn't set the world alight with the underfunded car the project was shelved. Having been associated with Larrousse between 1987 and 1991, a deal with the French outfit was an option but the team was already on the verge of collapse, switching to pay drivers to see out the season. At the end of 1994 the team indeed folded. The same scenario was unfolding in F3000: the 1994 championship was dominated by Reynard, their 94D design - whether powered by the Zytek Judd KV, Cosworth AC or Cosworth DFY/DFZ - proving all-conquering in terms of race wins, poles and fastest laps. Lola's only remaining customers - Omegaland and Nordic - were nowhere, with Omegaland switching drivers almost every race and Nordic cutting their operation to one car for Marc Goossens after just five races. The seeds for this F3000 debacle were sown the years before. Five years earlier Lola had been an equal force to Reynard in F3000, with Comas taking the title for DAMS in 1990. In 1991, however, the tide shifted. Just a handful of teams decided to stay with Lola: DAMS as the unofficial works team, crack outfits Forti Corse, Paul Stewart Racing and Eddie Jordan Racing, plus one-car entries from Vortex and Galaxy. Their results were pretty disastrous, as the Reynard-equipped teams of Pacific, Il Barone Rampante and Crypton shut out the championship, leaving Lola and Ralt to pick up the crumbs. By Mugello Forti had ditched their T91/50s for 91Ds, after which Naspetti became a race winner, while EJR gave Damon Hill a Reynard for the last race, preceding their all-out Reynard switch for 1992. Damon immediately qualified and finished third. The talents of Allan McNish and Laurent Aiello had been severely wasted during 1991, and they sought refuge elsewhere. Aiello signed for 1991 winners Pacific while McNish jumped ship to ex-Ralt team 3001 International, now also equipped with the almost ephemeral Reynard chassis. The only teams left to represent Lola were DAMS, Apomatox and GJ, but the championship was again all about the Italian Reynard teams, Luca Badoer dominating proceedings for Crypton. Meanwhile, PSR was the next Lola team to make a mid-season move to Reynard. 1993 was a true Lola annus horribilis, with the T93/30 F1 car also proving the embarrassment of the GP field. With every team in F3000 opting for Reynard, Lola wasn't even represented in the category in which they had still been a race winner with Jean-Marc Gounon in 1992. Even their 'works' team DAMS switched to Reynard, as Gounon's surprise win at Magny-Cours in the final race (leading Apomatox's Olivier Panis, also in a Lola!) wasn't enough to convince them to stay with the Huntingdon marque. All that was left was Japanese F3000, but Reynard was making hay there as well. By these standards their re-entry with Omegaland and Nordic was something of a comeback, although the marque's 1995 presence was equally modest, keeping their toe in with Nordic, one Danielson car (later expanded to two) and a singleton Draco entry for the talented Marco Campos. A win for Nordic's Marc Goossens at Hockenheim meant some light at the end of the tunnel in a time the supplier for the upcoming one-make formula was about to be announced. On the grid at Melbourne, the cars were the next disgrace in Lola's sequence of 90s embarrassments, Vincenzo Sospiri and Ricardo Rosset failing to qualify by a monster six seconds. By the next race in Brazil the sponsorship deal with Mastercard had predictably fallen through, the credit card company unwilling to fund an enterprise so evidently based on quicksand. As a result the Lola company tumbled into a financial downward spiral, leading to the end of Eric Broadley as the director of Lola Cars, Inc. The fact that the Lola marque is alive and kicking as of today is all thanks to Mondello Park track owner Martin Birrane, who salvaged the company from bankruptcy and brought the Lola name back to where it belongs - the winner's circle. As for Allan McNish, it's almost unimaginable that the ultra-talented Scot - once undoubtedly the better of David Coulthard in their karting days, and already then touted as the new Jim Clark - has gone without a single F1 drive throughout the nineties. It's only poetic justice that after all those successful years in sportscars he finally gets his chance in a highly professional GP effort. It's not often that a driver that has been neglected by the F1 fraternity for such a long time is picked after all to prove his worth at the very top. What chance has Tom Kristensen as a Grand Prix driver?